Watching the great church burn stirred up so many mixed feelings in me. One was just that sense of futility. Maybe you’ve seen something like this in your life, your health, your relationships or your work. You work so hard to build something up, to preserve it, maybe even pass it on from one generation to another, for a thousand years even…and then in a single afternoon it can literally go up in smoke. What once was full of light and life is now a pale, gray ruin. Frailty and decay seem to have the last word. Notre Dame, like the Twin Towers, is far more than just a building or unique work of architecture. It is a symbol. Perhaps as much as any building anywhere in the world Notre Dame is the Symbol of our Western, CHRISTIAN, Civilization. It is a symbol of Christian faith, the faith-motivated cultural and technical achievements of our ancestors, and of the yearning of human hearts for a transcendent beauty and harmony that can ultimately be found in God alone. I’ve heard stories of people with no particular faith in God who visit some of these great Cathedrals as tourists, only to leave the place haunted by the sense of beauty and glory they’ve encountered, asking questions they’ve never asked before that send them searching, until they finally come to find that their longings are satisfied in the embrace of Jesus Christ. A gothic cathedral is not just an auditorium where one goes to hear a teacher…the building itself is a teacher of the depths and riches of our faith. Everything about it, from the cross-shaped floor plan, to the Bible stories depicted in stain glass windows, even the number of windows, the mathematical proportions of the building, everything about it is designed to express the truth and beauty our Christian faith. 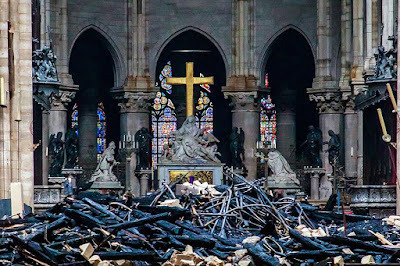 It also struck me as very…interesting…that Notre Dame burned during Holy Week, during Passion Week: This week when we remember Jesus’ betrayal…his arrest…we remember how Peter denied Christ…we remember his suffering…his pain…his crucifixion…and finally his death upon the cross to take away our sins. And during THIS week, one of the World’s most significant symbols of Christian faith, Christian civilization suffers a devastating fire. I couldn’t help but wonder what it means. Many countries with a strong Christian heritage – and France especially - have increasingly embraced an aggressive secularism that has no time for God, that denies Christ, and has no confidence in any unchangeable Truth. We don’t generally spend 200 years building gothic cathedrals anymore; we build shopping malls and sports arenas surrounded by acre upon acre of gray asphalt (temples to consumerism and entertainment). 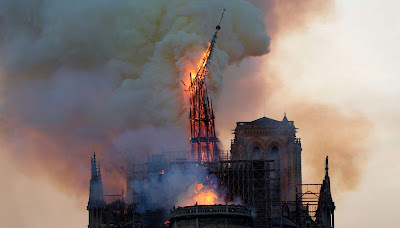 I watched the glorious cathedral – built during the ‘Age of Faith’ – burn in the midst of a fiercely secular city, and I wondered, ‘Could it be a sign, even a warning?’ What good is it, asked our Lord, to gain the whole world and yet forfeit your SOUL? (Mt. 16:26; Lk. 9:25). I believe many people in our secular societies are desperately hungry for something that you cannot buy on Amazon or win in the playoffs, you cannot find it in a political cause or even in a romance; we are looking for truth, for justice, for beauty, for a Spiritual Harmony, for a Meaning and a Mission which we can without reservation or regret give ourselves to completely. We are hungering for God, the Living God (Ps. 42). Could this somehow be a sign for our times of the spiritual desolation and emptiness that comes when faith is lost? Or could this event, in the midst of Passion Week, somehow spark a re-awakening? In college I went with some friends to London and Paris one year for Spring Break. On EasterSunday, 2004 (15 years ago today) we went to worship in Notre Dame Cathedral. There we heard the old story again. You’ve heard the story: What once was full of light and life was a pale and gray ruin. The body of Jesus sealed in a cold tomb. He taught the way of holiness and love in a way that captivated the crowds; his words amazed humble fishermen and learned philosophers alike; he healed the broken, and touched the untouchable. His life was good and true and beautiful, and called for our total allegiance in a way that challenged everything in this sinful, broken world. And so we killed him. Our injustice, our foolishness, our short-sightedness has simply been overwhelmed by God’s power, God’s love, God’s Truth. This is Easter; this is Resurrection Day – there is Hope springing up in the ruins; there is Life bursting forth from the grave, and His Name is Jesus, and He is Lord. This is the Last Word! Then the Angels said to the women, “Remember!” Remember Jesus! Remember his words! 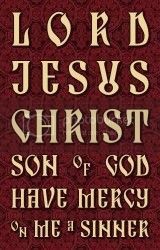 Remember how he told you…that the Son of Man must be handed over to sinners, and be crucified, and on the third day rise again. 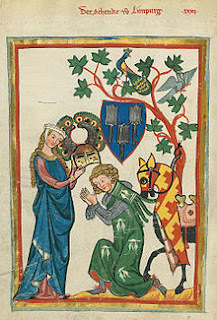 (v.7). ‘Then,’ says verse 8, ‘they remembered his words!’ They remembered! 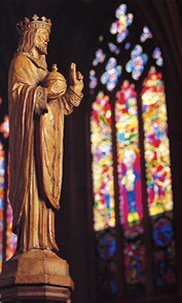 I pray that people all across this globe will remember Jesus, remember his words, will rediscover the faith that inspired our forefathers to build Notre Dame; will remember that there is a Solid Truth that has given hope to millions across the Centuries, even in the face of death and loss. There is a divine order to things, a solid rock you can build your life upon. There is a Heavenly Love, a glorious vision of God – this Lord who loves you enough to come and die to win your heart and save your soul – that vision has the power to transform and sustain your life, and even the life of a whole civilization. He Lives! And He offers his own Risen Life to you as a gift! Do you remember? Was there ever a time when His Truth set your heart ablaze? When you gave your heart to Christ? And does that faith burn in you, or has it grown cold? Now is the time to remember, to consider, to ponder this old story, to believe and to find Life anew in Him! Whether you’ve been a committed follower of Christ for decades, or are just here today as a seeker asking questions, we have Good News. Today we remember His promises of forgiveness and new life; we remember his Goodness and Love, and today remember his power to bring Hope even among the Ruins! 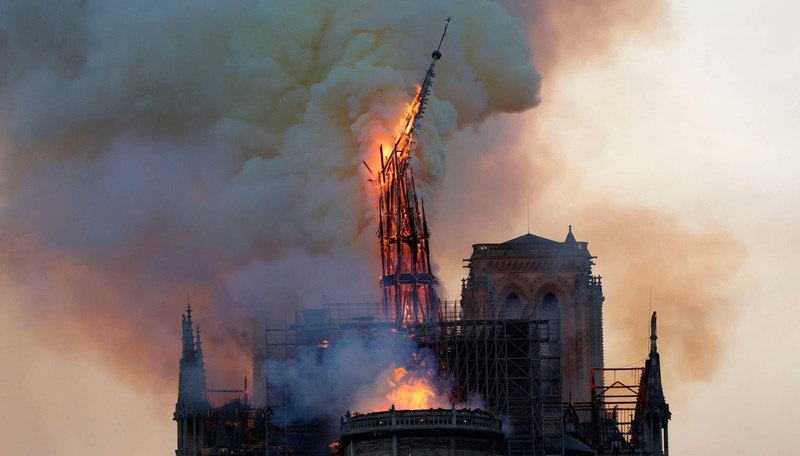 You can contribute to the rebuilding of Notre Dame HERE. You can contribute to the rebuilding of the 3 Louisiana churches burned by arson HERE. I just wanted to briefly post to share a link to a blog from a like-minded Methodist thinker working to recover and promote Methodism's rich liturgical and sacramental heritage: High Church Wesleyan: Rumination by Dr. Ryan N. Danker. Also, though his blog, I've discovered The Charles Wesley Society, which just had its annual meeting in Washington DC (missed it!). I think religious orders and religious societies are wonderful tools that God has used to strengthen and defend and renew the Church and her faith over the centuries, so I'm always excited to discover more of them. Not sure how much blogging I'll do in the future, though I do have at least a couple more posts-in-formation. Having a busy pastorate, a family, a ridiculously long reading list, and even a few other hobbies has certain forced me to cut back on blogging, but life is full with blessings and I'm content. Thanks be to God. At long last here is my final post commenting on The United Methodist Church's upcoming (in just 3 weeks!) General Conference and the options before it. In previous posts I've summarized the current situation in the world-wide United Methodist Church as well as several possible paths for a "way forward." I've shared material from both supporters and opponents of the "One Church Plan" ("local option" for sexual morality and the definition of marriage), and explained in detail my own concerns about this plan, which are serious indeed. As I've been discussing this issue with laity in my local congregation, I've come to realize that, should any of the 3 options that have been sent to General Conference pass, a decision would have to be made at the local level. Under the One Church plan, for example, local churches would have to decide whether or not to host same-gender wedding ceremonies in their church-houses. Now I want to look at bit more at the other two plans that were crafted by the Commission on a Way Forward for the General Conference to consider. The Traditional Plan is by far the simplest to execute because it makes no changes to church teaching, nor requires any constitutional amendments. This alone is a huge selling point. Beyond that, I believe that it is also the most likely to preserve the largest degree of institutional unity within the denomination simply because it maintains the current teaching. If people found our teachings on sexual morality absolutely intolerable, then presumably they would not have joined our churches or received ordination to join the ranks of our clergy. While a great many conservatives, evangelicals, and traditionalists have signaled that they would leave the denomination if the teachings are changed in a more liberal direction, it seems likely that most of our progressives and liberals will remain within the denomination if the current teaching is retained, since (for the most part) they have already been able to live with that teaching for years. What will the traditional plan change? The main thrust of the Traditional plan is to increase accountability for those clergy and bishops who refuse to live in accordance with Church law, despite their own freely-accepted ordination vows to uphold the same. This failure to, as our Lord says, "let our yes be yes" has caused a crisis of trust in the leadership and is a major reason we have come to the very brink of schism. The Traditional plan aims to put in place serious consequences for clergy and bishops who break their vows. I fully support the increased accountability in this area. My concern (shared with many liberals, I would expect) is that we become too overzealous and heavy-handed in a rigid enforcement of doctrine. That outcome seems relatively unlikely in a denomination that prides itself on a "theology of grace," but I have heard one or two of our more conservative colleagues make comments about "running the liberals out" and I think that is an attitude contrary to the spirit of Christ's teachings (remember the parable of the wheat and the tares?). Rather our aim should be, in my view, to simply and clearly hold everyone accountable to the same standards that they originally signed up for. There can be no "purifying" of the church (church history is full of disastrous attempts in that direction), nor any peering into men's souls to hold them accountable for their feelings (which are prone to change over time in any of us) but simply a commitment to uphold the rules and apply a consistent standard for all who freely choose to become clergy. I've heard some people saying that the Traditional plan would require clergy and bishops to certify, in writing, that they believe in the church's teachings. This seems to be based upon misinformation. I have spoken with one of the drafters of the plan, and he assures me that it does not focus on inward beliefs but simply on outward adherence to the standards set forth in the Book of Discipline, which should be no great problem, since we have already agreed to that in our ordination vows. My other main concern about the Traditional plan is that only about half of it has been declared to be "constitutional" under the UMC's constitution by the Judicial Council. Some aspects of the plan were declared unconstitutional and had to be dropped or reworked, so that what is really coming before General Conference is a modified Traditionalist plan. It could be that the changes that have been made by the crafters of the plan still fail to pass constitutional muster, in which case General Conference will have passed only a 'partial Traditional plan' or 'Traditional plan lite' which may prove ineffectual in addressing our problems. What would the local church have to decide under this plan? One aspect of the Traditional plan that intrigues me is the "gracious exit clause" which would allow congregations who are willing to agree to certain stipulations to leave the denomination and keep their property. Currently if congregations cut ties with the denomination the property reverts to the Annual Conference. So, if the Traditional plan passes congregations would need to decide whether to stay within the UMC or to leave (though presumably, unlike the other plans, it is safe to say that there would be a firm "default" position, namely, staying in the UMC). The gracious exit clause is fiercely opposed by the bishops who (rightly) see that larger churches (including many of our evangelical churches) are both greater contributors to and also less dependent upon the denominational institutions than smaller churches. These larger churches could more easily leave and become self-sufficient but what would become of the churches that remained? Would they find the weight of the denomination's institutions far too heavy to maintain? Yet the argument for a gracious exit clause is simple: congregations can leave anyways, and churches that feel betrayed, rejected, or embarrassed by their denomination, churches that no longer have a heart to support the institutions should not be 'held hostage' in a denomination for which they no longer have any love. What good is having that sort of 'unity' anyway? Just to squeeze money out of people? Another argument is one of simple fairness and justice: if the local congregation members paid for the property and maintained it, is it really fair that the fruits of their own labor be taken from them if they dis-associate from a denomination that (they believe) no longer represents them? My view is that even a Traditional plan Lite would still be a good option. The final plan being recommended for the consideration of the General Conference is the Connectional Conference plan. This plan is the most cumbersome to enact and, for that reason, has been dismissed by many people I've spoken with as a non-starter. Though in more recent weeks I have seen some delegates pledging to support it. There are several things about this plan that interest me. Strictly on a political and institutional level, the Connectional Conference Plan is the truest "compromise" between Traditionalists and Liberals. If the Connectional Conference Plan passes then nobody "wins," and I can see a certain appeal about that, perhaps as a way to try to "bear with one another in Christ." Because the Connectional Conference plan actually segregates conservative clergy and bishops in one conference away from liberal clergy and bishops in another (and centrists or "unsure" in a third), it actually eliminates the problem (or perceived problem) of clergy being 'punished' for their convictions by bishops or cabinets who hold an opposing view, which I do not believe that the One Church plan can really guard against, despite its best efforts. I also suspect that the Connectional Conference plan is actually a plan that most of our committed liberals and perhaps even most of our committed conservatives could "live with" if enacted, though I expect neither would be enthusiastic about it. I am quite confident that it could at least keep more people within the "big tent" of the denomination than the One Church plan. One main question about the Connectional Conference plan is whether it would in fact be a stepping stone along the path to full schism. Would the (now segregated) liberal and conservative "conferences" have less and less to do with each other, functioning as 'de facto' separate denominations until, at some point in the future, they cut what few tenuous ties remain? That seems quite plausible to me. 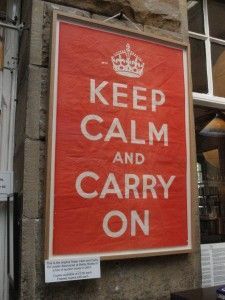 Now there are plenty of people who say that a full split is inevitable (or indeed, has already, in fact, begun), so perhaps enacting the Connectional Conference plan would be a way to manage that split in a careful and gracious way. One is that it would be expensive because it would duplicate some offices and institutions 3 times over (where currently there is one, there might be three), which means fewer United Methodists contributing to support each church institution, thus raising the cost. This seems a realistic possibility, though I'm not sure exactly which offices or institutions would supposedly be duplicated. Another real concern is how the Connectional Conference Plan would work "on the ground." I heard a colleague joke a few years ago that if a conservative jurisdiction and a liberal jurisdiction were created, and clergy and churches given the choice which to join, most all of our ordained clergy would join the liberal jurisdiction and most all of our churches would join the conservative one. While certainly an exaggeration, his joke has some truth to it, and raises in general the question of uneven distribution of clergy who need jobs versus churches who need pastors. Would pastors and congregations decide which jurisdiction to join in coordination with one another? This surely will raise new challenges that would need to be addressed. Like under the One Church plan the Connectional Conference plan would ultimately force each congregation to "choose a side" which could potentially devastate the unity of the local congregations. Unlike under the One Church Plan, however, once the choice had been made there is very little possibility that a new pastor with the opposite view would be appointed who wanted to revisit the decision. This is a major improvement, in my view, from the One Church Plan. Yet the Connectional Conference Plan also has the same theological problems as the One Church plan: The United Methodist Church would claim to be one church (sort of) with one message, yet teachings regarding the definition of marriage, which behaviors are sinful, and what God's will is for your sexuality would be officially contradictory from one United Methodist Church to another. That problem would, I think, "feel" more distant, however because all Methodists (conservative and liberal alike) could say to themselves, "At least in my Conference everyone teaches the truth (as I understand it)." But it would be a compromise, and one wonders if a compromise is tenable in the long run for people (both traditional and progressive) who understand themselves as trying to follow a Lord who chose to be crucified rather than compromise with falsehood. This plan may be a bit of a 'shot in the dark' to preserve institutional unity, but (for all its serious flaws) I think I would personally be willing to at least give it a try, that way at least we will not have run hastily into schism, and will have actually been willing to make sacrifices (on both sides) to preserve unity. I realize that I have left out a great deal and glossed over many details in this discussion: Time constraints have prevented me from going into more detail about either of these plans. I am happy to have finished, and 7 posts seems a nice number. What will happen? God only knows. Maybe some of you have some insight. I'm praying. I invite you to pray for United Methodists. Pray for the delegates to the upcoming General Conference. Pray that whatever decision is made that we will treat one another with Christian love, even if (as will likely happen) many feel that they can no longer be a part of the denomination depending upon the decision that is reached. I am praying for spiritual unity, for fidelity to the Bible and the classic Christian faith, and a spirit of charity under the Lordship of Jesus. And, quite frankly, I'm praying that there will be a way forward for me in my vocation and for my family that does not involve the loss of my employment, my pension, and the roof over our heads. It is a stressful time for United Methodist clergy and we could use prayers too. But I believe that in the long run 'the Lord does provide' (Gen. 22:14) and can even use this particular season of uncertainty to sharpen within us the spirit of holiness and conform us more fully to the image of his beloved Son, our Lord and our Savior (Rom. 8:29). When I was in seminary, my first year Greek class was taught by David Watson, who was at that time writing a doctoral dissertation on the Gospel of Mark, and was easily one of my best teachers in my time at Perkins. Today Dr. Watson is the dean of United Theological Seminary, one of our official United Methodist schools of theology, which has seen a renaissance under his leadership. Dr. Watson is a clear thinking scholar who loves the Lord, the Church, and the Word of God. Dr. Watson has also recently published a critical piece pointing out some major problems with the "One Church Plan" that many of our bishops hope (see previous post) will be adopted by General Conference in February as a way for the United Methodist Church to preserve its institutional unity in the midst of our disagreements over how to apply Biblical and traditional authority in the church, in particular as it relates to the issues of sexuality and the meaning of Christian marriage. I heartily encourage you to read his full post: The One Church Plan: Problems of Governance and Theology. As I let the bishops "speak for themselves" in the last post, I'll be making generous use of quotations in this one, so that Dr. Watson can speak for himself, with some comments of my own, of course. 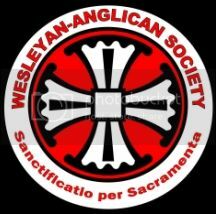 I believe that the Bishops, as a group, have greatly contributed to this crisis by continuously affirming as a group that they will uphold church teachings and church law, but then being apparently unwilling or unable to follow through when clergy (or even other bishops) choose to ignore church teachings as affirmed by the General Conference. If General Conference itself can be discounted, how then can the diverse institution be held together? The solution they offer changes our governance, moving some decision-making authority to local churches, individuals, and annual conferences....Noteworthy is the move toward a polity based on individual conscience, rather than on the collective decisions of the church. One might object that the OCP shifts decision-making power only with regard to matters related to homosexuality, but its basic principle, clearly spelled out in its “Theological and Biblical Foundations,” is that our deep disagreement necessitates this shift. Were we to follow this same principle moving forward, whenever there is deep disagreement at the level of the General Conference, we should simply move decision-making power to local levels. Beyond issues of governance (church polity), the One Church Plan, says Dr. Watson, raises significant issues of theology. There are also numerous theological problems. For example, a proposed amendment to ¶105 reads, “As we continue to faithfully explore issues of sexuality, we will honor the theological guidelines of Scripture, reason, tradition, and experience, acknowledging that God’s revelation of truth and God’s extension of grace as expressed in Jesus Christ (John 1:14) may cause person of good conscience to interpret and decide issues of sexuality differently” (20, italics mine). By this rationale, our disagreement results from God’s revelation of truth and grace. How God’s revelation and grace have led us into this confusion is unclear, as is God’s rationale for doing so. Apparently, God is in fact the author of confusion (contra 1 Cor 14:33). This is an interesting point. In the italicized sentence "God's revelation" is what "may cause persons of good conscience" to disagree. How can the Church officially affirm such a thing? Surely it is our finitude or limitations or sins that "cause" our disagreements, and not God's own revelation? Perhaps a better rationale would be, “For now we see in a mirror, dimly, but then we will see face to face. 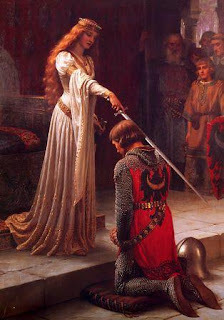 Now I know only in part; then I will know fully, even as I have been fully known” (1 Cor 13:12, NRSV). In other words, in our human brokenness and finitude, we may not be able always to perceive God’s truth with clarity. This would mean, however, that some people in our denominational debate have perceived God’s will more clearly than others, which the OCP is loathe to concede. Then it cannot follow logically that our mutually-contradictory interpretations of what marriage means are both correct and both equally in harmony with the one Divine Will. Such an assertion runs contrary to Reason. Watson then goes on to note that the OCP document does not offer a theological rationale for its new revised definition of marriage, which means it could be an unstable definition resting (potentially) shifting sands. What if, for instance, advocates of "open marriage" begin to assail the revised definition, if there is not a theological and Biblical rationale for why marriage must be monogamous? Finally, Watson criticizes the way the One Church Plan document deploys the language of 'religious liberty'. Long time readers of this blog will note that I have, along with many Libertarians, long been an advocate of addressing some hot-button culture war issues in the United States at the State and Local levels whenever possible, instead of forcing upon us a one-size fits all approach from the Federal Government which inevitably does not take into account the very real differences in cultures among the states. Religious liberty is a notion at home in the sphere of civil government. It protects religious groups and individuals from restrictions and interference by the government in the expression of their beliefs and practices. As an ecclesiological concept, religious liberty is as out of place as a pig in a rose garden. Churches are communities of faith and practice. In the United States, joining a church is, in and of itself, an expression of religious liberty. The decision to order one’s life in keeping with the teachings of the church is also an expression of religious liberty. Such liberty is necessary so that people of faith can live out their convictions in a society that does not always share those convictions. But should people of faith be protected from the convictions of the communities of faith they have freely chosen? The use of “religious liberty” in the OCP betrays a deep confusion about the difference between a church and a civil society. This confusion, moreover, runs through the entire plan like a foundational crack that will eventually result in the collapse of the entire structure. To be honest, I am not entirely sure what the best way forward is for our denomination. I do believe, however, that the OCP is too deeply flawed on too many levels to move us forward in faithfulness and integrity. I appreciate Dr. Watson's tireless work to revitalize the church and its theological education (much-needed work that has borne some fruit already), as well as is less-well-known work to make the church more accessible to individuals with disabilities and learning disorders. I hope people will consider well what he has written. Again, the FULL Article is HERE. In my next article, I will offer my own concerns about the One Church Plan and my assessment of the other two plans as well. If you have been following this series of posts, you know that there are three Proposals for "A Way Forward" for the United Methodist Church to preserve its institutional unity after years of conflict over theological issues surrounding sexual morality, and also how to interpret and apply the Bible and ecclesiastical authority with relation to this (and other) contentious issues. The Commission on the Way Forward submitted 3 different proposals for ways that the UMC could deal with its conflict. There was some confusion over whether these proposals were being submitted to the Council of Bishops for consideration and selection of only one, or if all three were to be reported directly to the General Conference. In the end, all three proposals have been offered to the General Conference for consideration, and a majority of the Bishops (but, by no means all of them) on the Council of Bishops have chosen to "endorse" the One Church Plan, which is also sometimes called the "Local Option" plan, because it empowers local congregations, clergy, and annual conferences to make their own decisions about sexual morality and the definition of marriage. Thus, one United Methodist congregation might hold one teaching on "God's will for Christian marriage" while another UM church across town might hold a different (even contradictory) view. The bishops (or at least, most of them) chose to endorse this plan as an attempt to make space for liberals and conservatives, progressives and traditionalists and anyone in between to all co-exist under the same rules, with greater flexibility given to the local level. Because the bishops chose to focus on the One Church Plan, it was by far the most "polished" of all three plans developed by the Way Forward Commission (which relates to the Judicial Council decisions discussed in post 3). Some have grumbled that it was inappropriate for the bishops to endorse any plan at all since doing so could potentially undermine the work of the Way Forward Commission and the General Conference, and indeed the bishops are as divided as the larger church, and so the endorsement could simply be interpreted as the point of view of one faction rather than a Council of Bishops that is somehow "above the fray". On the other hand, others have suggested that in making an endorsement the bishops are offering leadership and guidance to the church in a difficult and anxious time. Still others have wondered if the bishops will end up with "egg on their face" or even a some kind of crisis of credibility if the General Conference does not pass their preferred plan. I guess I keep saying this: only time will tell. But I trust that God knows how this all plays out and, as we children used to sing, "He's got the whole world in His hands." Here is a video featuring several of the bishops, including my own bishop, promoting the One Church Plan. For a different perspective my next post will feature a critique of the One Church plan from one of my former seminary teachers, a prominent United Methodist Theologian, Dr. David Watson, whose leadership has helped bring revival to a (previously) declining United Methodist Seminary. Then my final post in this series will explore some of my own reasons for opposing the One Church Plan in favor of a more traditional model of some kind (though, as you will see, there are some aspects of the Traditional Plan that I do not especially like). There are some things I really like about the Connectional Conference Plan as well, and I'll share some thoughts on that. Late last month, a long awaited ruling from the Judicial Council (i.e., ecclesiastical Supreme Court) of The United Methodist Church was issued related to the upcoming special session of General Conference in February 2019. To read my full review of how we got here, read Part 1 of this series of posts. To address The United Methodist Church's disagreements over Biblical interpretation, Church authority, and sexual morality the world-wide General Conference of 2016 created a special "Commission on a Way Forward" to offer recommendations. After two years of work, the Way Forward Commission has suggested 3 possible plans for preserving the institutional unity of the denomination in some form or other. These three plans may be considered by a special session of General Conference in February of 2019 that has been called to deal with just this issue. 3) The Connectional Conference plan would radically restructure the denomination to group congregations and annual conferences into "Connectional Conferences" based upon theological convictions. Presumably there would be a Traditionalist Conference and a Liberal Conference, and perhaps an "in between" Conference. Annual Conferences and Congregations and pastors would then all decide which way to affiliate. Each plan consists of a number of separate pieces of legislation, which together have a cumulative effect. The Council of Bishops wisely requested that the Judicial Council look at each plan to determine whether it is constitutional under The United Methodist Church's constitution. The Judicial Council has released its decision, which you can read a more complete description of at the Central Texas Conference Website. In short, the "One Church Plan" requires only very minor modification to pass constitutional muster, so it is basically ready to go. The "Traditionalist Plan" had more difficulties. Of the 17 petitions that make up this plan, 9 of them are either partially or wholly unconstitutional. If the remaining 8 petitions were passed, perhaps with a few of the others in modified form, we could end up with a Traditionalist Plan "Light", that would clearly express the direction that the Church intends to head, but would also have less "teeth" in terms of accountability for those who break their ordination vows. I have no doubt that Traditionalist groups are hard at work to come up with corrections or alternatives to avoid a "Light" plan, but such a revised plan would not have the benefit of having been "pre-approved" by the Judicial Council, and could be (partially) struck down after the General Conference ended. Finally the Judicial Council did not issue a ruling at all upon whether the "Connectional Conference Plan" is constitutional, since it would require amendments to the Constitution and so would be judged under a different constitution, as it were, and the Judicial Council did not want to issue a ruling on hypotheticals. This leaves even more questions hanging over the most complicated of these three plans, that many see as both the truest compromise between liberals and conservatives and also the least likely plan to actually be adopted. Of course, as I've stated in the first post on this topic, the General Conference could (theoretically) discard all of these and create a whole new plan from scratch. Time will tell. This is the second post I am sharing regarding the future of The United Methodist Church after the special General Conference of late February 2019. The FIRST POST I shared on this topic linked to THIS PIECE from Rev. Lynn Malone which is well worth the read. Rev. 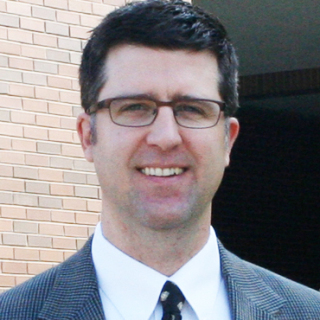 Malone has been a pastor, district superintendent, and General Conference delegate, and is thoroughly familiar with the inner workings of United Methodism. Lynn laments that no matter what General Conference chooses to do, including a choice to pass no legislation, there will be additional pain and division within the church. Lynn's very sober assessment ends with a word of hope: who knows what sort of resurrection God may yet bring? Now, for a different perspective, I'm sharing THIS POST from Rev. Thomas Bowsher, a pastor in the Dakotas Conference. Rev. Bowsher's post was recently highlighted at UM NEWS. Bowsher argues that The United Methodist Church is at a critical crossroads because the values that have held United Methodists together are no longer understood in the same way by all Methodists; for this reason, he says, a split of the church is now inevitable. Bowsher says that we are deceiving ourselves if we think that the General Conference 2019, or any of the three plans submitted to it (or any plan that the General Conference itself can produce) will actually put an end to the bickering and division within the Church. Bowsher also argues - and is echoed by many traditionalists on this point, and even a few liberals as well - that because a split is inevitable, the leadership of the Church (including GC2019) should be working to make that split as smooth and amicable as possible. "We are deceiving ourselves if we believe that maintaining unity as a denomination is the same as unity in the body of Christ. We are not biblically commanded to maintain unity as an organization. However, we are called to be in unity as brothers and sisters in Christ"
In discussions of church unity, people have often pointed back to Wesley's sermon about the "Catholic Spirit" as pointing a way forward for divided Methodists. But what has not so often been pointed out is that, in this sermon, Wesley clearly is addressing Christians who are already divided into different denominations over theological differences, but who are nevertheless working and praying together for the mission of Christ. In other words, Wesley is addressing how Christians of different stripes can work together in love, not whether Christians in the same church who are crippled by disagreement ought to split or remain institutionally united. Wesley does not address institutional unity in that Sermon, but unity in heart and unity in love. At this moment, Methodists would do well to consider where these differ and where they overlap. We should consider how (and if) we can maintain loving fellowship while also dividing institutionally OR how (and if) we can maintain a loving fellowship while also remaining locked together in a continuous and acrimonious fight for control within the institution. I fear that Bowsher is correct that some kind of split is inevitable, either a formal "top-down" split arranged by a General Conference or a less formal "bottom-up" split as families leave congregations, and congregations leave the denomination. This is already happening (as the departure last year of the Mississippi Conference's largest congregation reminds us) and it is every bit as much of a real schism in the body as a "top-down" split because the church is composed of people and congregations (including those that will leave), not simply institutional machinery such as boards and agencies and seminaries. Many theologians and pastors have been asking for some time now the question: "Has the split of The United Methodist Church in fact already happened, already begun?" Bowsher is implicitly suggesting that our current situation points us towards the limits of diversity and inclusion. As 21st century Westerners and as United Methodists we have been quick to repeat the mantra, so celebrated in our culture, that 'diversity is our strength', and it can be a strength indeed. However it should be clear with even a few minutes of clear thinking that some forms of diversity can also become a weakness. How can we walk together if we are determined to walk in divergent (i.e. 'diverse') directions? Does a marriage become stronger the less and less that a husband and wife have in common (which is to say, the more "diversity" there is between them)? Bowsher is asking how can Methodists maintain unity if we no longer understand our core values in the same way (i.e. if we have a 'diversity' of contradictory understandings)? Wesley raises this same point in his sermon when he says "two cannot walk together unless they be agreed", quoting from Amos 3:3 (KJV). For a large institution - especially a religious institution - to remain united, there must be agreement on the core values and the basic, "non-negotiable" beliefs and practices, and that agreement must be spelled out clearly in black and white, not left up to the reinterpretation (or misinterpretation) of each individual or faction. This clarity on core principles is precisely the function that the Book of Discipline was created to serve. The Discipline gives expression to the mind of the whole global church that United Methodist faith and practice is "this, not that." And yet it is the authority of church teaching and church law contained within The Book of Discipline that is now being openly challenged by some pastors, and even a few bishops. Do we then have enough agreement on core principles to walk together in a unified direction? Bowsher is not so hopeful on this point. For my next post I'll be looking at a recent Judicial Council ruling on whether the plans submitted to General Conference are constitutional.